While there is no question of government enabling, (by decree or inaction), market manipulations haven’t really changed all that much in character over the centuries. The players have morphed into giants. So large that they obscure general perception by virtue of nearly complete diffusion. If we could simply wrest it from the clutches of the system, we would push the button and make every thing go away. If the Commodities Futures Trading Commission 'acted' now to stop it, simple awareness of the event would create chaos. If a few large traders decided to stand for delivery, equal chaos while the 'rogue trader' meme would spread as the trades were cancelled. The ultimate reality is that despite the ineptitude of leaders and officials, the system of finance will implode into a currency collapse. Is it any wonder that the largest, most concentrated trading position of all commodities is held short on 'money'? All we can really do is stand in our individual monetary provinces and take shelter from the inevitable storm. All price manipulation ultimately ends with suffering. Hand in hand with suppressing the rate of interest assigned to fiat, no greater obfuscation is that which (cannot be named) falsely backs the value of the legal tender of the moment. In the meantime, there is profit for the chosen. Do they really need the eggs? If we follow the money, we see that the same applies to the commercial bank suppression of precious metals. (Note: These are not banks in the traditional sense. They are massive hedge funds - giant nodes of risk in a massive worldwide system of currency and credit flows. They give real banking a bad name. But we call them banks a concession to the propaganda. They are nearly indistinguishable and as result, they hate each other fiercely). Make no mistake; price manipulation of silver by the large concentrated short on the COMEX is a profit center for the big bullion banks that inhabit the commercial category of futures traders. Yes, the mechanisms and tactics are fully enabled, but by virtue of this fact, direct government intervention is not required to function. It only needs tending to from time to time which simply tightens the noose further. Are these commercial banks intervening in all markets on behalf of government? Given the nature of the Federal Reserve and the blurred political lines between the Treasury, Wall Street (along with the 'legal' mechanisms by Exchange Stabilization Fund and Working Group), yes, of course they stand ready and do intervene in many markets. Spend a few hours looking over documentation from GATA for enlightenment. But silver is the big accident waiting to happen. 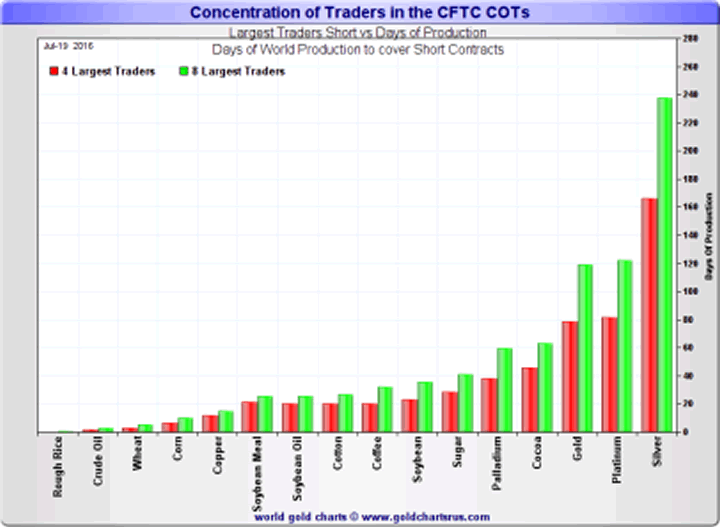 The silver market doesn't need hands-on government intervention because the CFTC allows the giant banks to build massive concentrated positions as prices rise, and then periodically cover those positions via HFT-facilitated spoofing, banging the close, etc. No need for swaps or leasing in the silver market because it's been so easy to enable banks to play the role of market maker while being the only short, letting the price action drive the perception of supply and demand. And of course, silver is not officially stockpiled by central banks. Again, for precious metals and commodities traded on futures exchanges, it is far easier to simply enable through lack of enforcement. Especially when enforcement itself was captured as soon as it was conceived. What we see at present is a battle between the central banks and the collapse of the financial system fought on two fronts. On one front, the central banks preside over the creation of additional liquidity for the financial system in order to hold back the tide of debt defaults that would otherwise occur. On the other, they incite investment banks and other willing parties to bet against a rise in the prices of gold, oil, base metals, soft commodities or anything else that might be deemed an indicator of inherent value. Their objective is to deprive the independent observer of any reliable benchmark against which to measure the eroding value, not only of the US dollar, but of all fiat currencies. Equally, they seek to deny the investor the opportunity to hedge against the fragility of the financial system by switching into a freely traded market for non-financial assets. It is important to recognize that the central banks have found the battle on the second front much easier to fight than the first. Last November I estimated the size of the gross stock of global debt instruments at $90 trillion for mid-2000. How much capital would it take to control the combined gold, oil, and commodity markets? Probably, no more than $200 billion, using derivatives. Moreover, it is not necessary for the central banks to fight the battle themselves, although central bank gold sales and gold leasing have certainly contributed to the cause. Most of the world’s large investment banks have over-traded their capital [bases]so flagrantly that if the central banks were to lose the fight on the first front, then the stock of the investment banks would be worthless. Because their fate is intertwined with that of the central banks, investment banks are willing participants in the battle against rising gold, oil, and commodity prices. This enabling allows to the banks agency to do what they like. With silver in particular, they enjoy 'market maker status' on the surface while building positions that cannot be resolved without inescapable and permanent damage -- with or without any amount of intervention including confiscation and taxation. The converging legacies of the state and money centers never fully merge. They serve each other in a bizarre symbiosis that ultimately drains both to death. The COMEX eventually becomes obsolete or symbolic, and the pricing mechanism reverts to a physical-based price discovery. Paper accelerates in loss of value in parallel. Or as an agent of power, the Big Four commercial banks who essentially control price based on the nature of concentration, decide they’ve accumulated enough to let the price - and the value of their hoard - return toward and beyond equilibrium. However it plays out - it’s not likely to happen in isolation. And it will be temporary as the fourth branch guides the story toward some other parallel agenda. All we can do use the moment to our advantage - for our survival. Low silver prices currently benefit the big banks - the profit motive sought by virtue of enabling and price control. Low prices benefit the users in the near term, which essentially allows for the continuation of and exploitation of an otherwise much more valuable resource. Lower silver prices also quiet the monetary canary in the coal mine. Of course, low prices potentially benefit those who perceive this for what it is - a brief opportunity. If it feels better, or more palatable, dress it up with fancy investment language. 1. To receive early notification for new articles, click here. 2. Or to view all of our products and services, click here. 3. Or...support the cause, and buy me a cold one! Copyright © 2015 Dr. Jeff Lewis- All Rights Reserved Disclaimer: The above is a matter of opinion provided for general information purposes only and is not intended as investment advice. Information and analysis above are derived from sources and utilising methods believed to be reliable, but we cannot accept responsibility for any losses you may incur as a result of this analysis. Individuals should consult with their personal financial advisors.